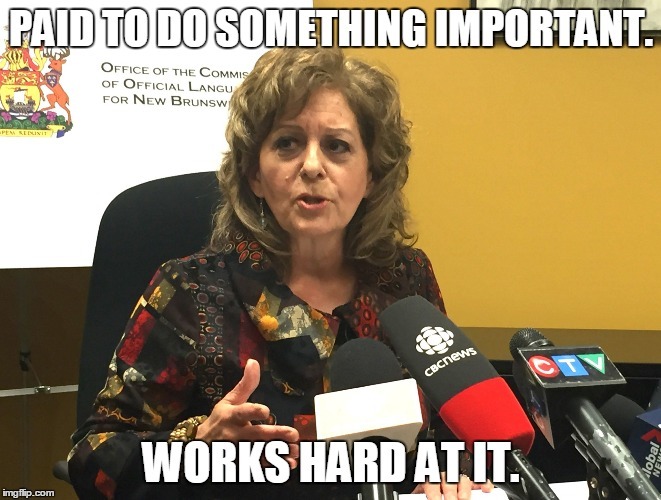 Fredericton — As a firestorm of controversy surrounds New Brunswick’s commissioner of official languages, leaks from the commissioner’s own office have uncovered new secrets about Katherine d’Entremont’s private agenda. While many speculate about her intentions and comment negatively about how she does her work, the new information reveals that d’Entremont has one overriding ambition driving all of her actions — wanting to be really good at her job. Katherine d’Entremont created a tsunami of criticism when a unilingual anglophone commissionaire’s hours were cut and he was reassigned to a new post after a brief encounter with the official languages commissioner. The commissioner stood her ground and published a report last March insisting that all commissionaires who deal with the public be bilingual. Since the commissionaire’s story went public, she has become a lightning rod for language tensions. It has also led some to call for her resignation on social media with unflattering and misleading memes, including accusations of leading an anti-anglophone movement. Skipper Jack’s fish restaurant in Moncton even used her in a language-themed meme to sell English-style fish and chips. “These memes and their associated nasty comments are not only distortions and hyperbole, but also have very disturbing overtones,” said political scientist Malcolm Richardson. “Whether people agree or not with the Wayne Grant decision, this reaction is clearly beyond the pale. Only 39 percent of the civil service is required to be bilingual, which is pretty fair considering about a third of the province is francophone. Also, people think she is part of the Gallant government when she was actually appointed by the Alward government. “She’s not some sort of super-villain or even a politician,” Richardson continued. “She’s just a bureaucrat who gets paid to make sure that francophones have equal access to public services as outlined in the Official Languages Act. Getting mad at her is like getting mad at a traffic cop for enforcing the Motor Vehicle Act, or a conservation officer for enforcing the Fish and Wildlife Act.